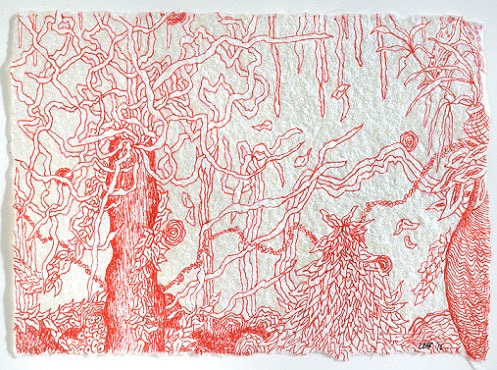 “Everything is interconnected, all that we know and everything we have yet to discover,” says the artist Carol Brown Goldberg about her new exhibition Tangled Nature at the Patricia and Phillip Frost Art Museum FIU in Miami. 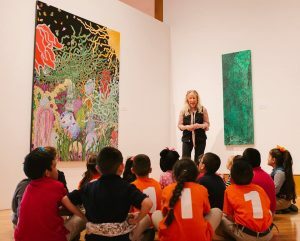 The exhibition features 52 recent artworks, most exhibited for the first time. 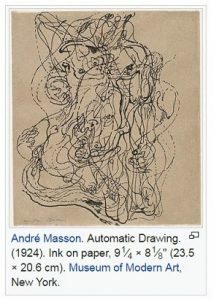 Goldberg takes a cue from the Surrealists by using the technique of automatic drawing ― allowing her hand to overrun the canvas in a wild, untamed flow, to allow the subconscious to take over. For even greater immediacy while creating this new series, Goldberg worked mostly in a mono-chromatic approach, with acrylic markers instead of brushes to reduce time by not having to mix paint colors. “This past year has been an age of anxiety for our world, and my use of black-and-white echoes the pertinent yearning for clarity,” adds Goldberg. The exhibition is curated by Klaudio Rodriguez and features ink on paper, acrylic on canvas and acrylic pen on canvas. On view through May 21 at the Florida International University campus located in southwest Miami (directions). 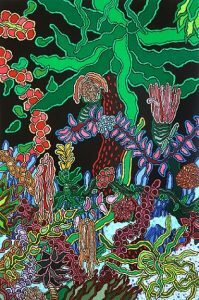 Setting her hands free from the conscious mind, the artist inscribes lines and images that take on a life of their own, creating worlds that are almost extra-terrestrial. The resulting experience inside the museum’s galleries evokes trance-like states for the viewer, fantasies derived from Goldberg’s inspiration from science, nature, spiritual technology and, especially, cutting-edge particle physics. 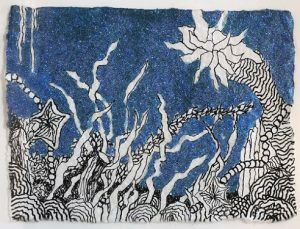 Goldberg’s process is purely free-flowing, “Whatever appears on the surface is meant to come to the surface and can be compared to the Zen state of emptying the mind,” says the artist. 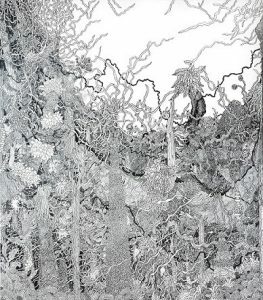 The artist’s body of work titled Extravagant Eden, transports the viewer to faraway, dreamlike gardens that mysteriously unravel across terrains of sinewy lines. 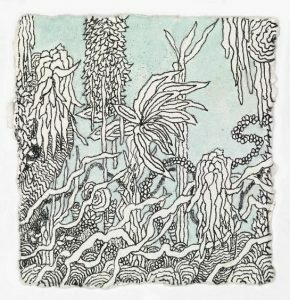 Through the outlines of her automatic drawing, Goldberg creates natural spaces that are vast – tendrils, vines, flowers and pods, roots and trunks all intertwine, mirroring the Butterfly Effect of Chaos Theory. Foliage explodes into spontaneous growth, each vine hedging out the other, reaching for its share of sun, air and space. 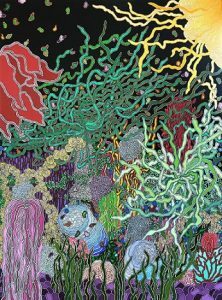 These biomorphic free-flowing creations also traverse beyond the natural world, exploring the complex webs of human relationships that ensnare all of us. Goldberg’s work pays homage to 20th-century masters such as Henri Matisse, Fernand Léger and Stuart Davis. Unbroken lines and bold colors figure prominently in Goldberg’s work. 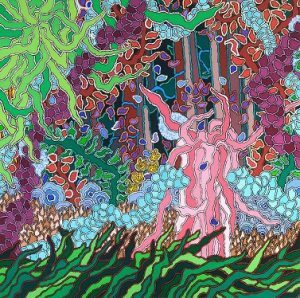 Although her work is guided by her subconscious, Goldberg’s lines and colors are deliberate, controlled and at times extremely intricate. 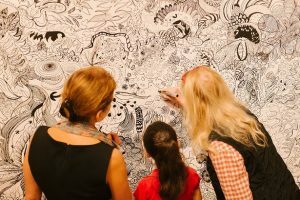 The museum has created a large-scale collaborative mural project within the galleries. 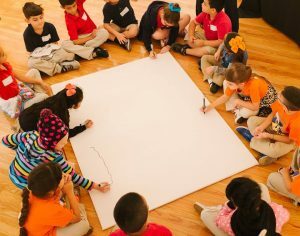 Taking on a life of its own, the mural has drawn in hundreds of participants including FIU students, professors, museum staff, docents, adults taking art classes, and many school groups from nearby Sweetwater Elementary School (who only receive one hour of art class per week). “This fantastic mural project has come alive as a never-ending creation without boundaries,” adds the artist. A continual work-in-progress, Goldberg returns on-site regularly throughout the duration of the exhibition to join her mural compatriots on this creative journey. “This mural is linking multiple visions into one organic collaboration, with never-ending lines that connect every person’s contribution,” adds Goldberg. The exhibition will next travel to the American University Museum in Washington, DC. 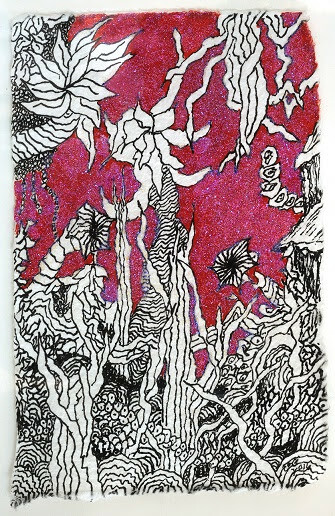 For more information about the artist and her work, visit carolbrowngoldberg.com. View this video from the Phillips Collection, featuring Curator Klaus Ottmann discussing the One-on-One series, an exhibition where works by Carol Brown Goldberg were placed in conversation with Henri Matisse’s Interior with Egyptian Curtain.